"My 3 yr old son helped Mommy make it. Although you said it took you 2 days, I just want you to know that this is My first project as a carpenter and it took me 6 days...... I had a few set backs...... like a forgotten floor brace or 2. Have you ever seen a chicken coop propped up with a grown woman laying under it putting the floor braces in??? It truly was funny and fun at the same time. 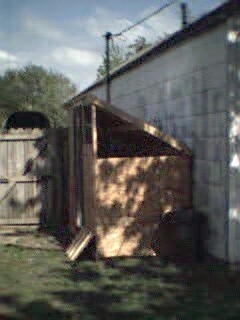 With all of it said and done we got a great dog proof chicken coop." "We had fun (as my son says) measuring and cutting and putting it together. Again thanks. If not for you, my son's chickens would still be living in my bath room." "Next we are making your nest boxes..... Hope it goes ok and we will keep you posted. Include is a picture of the finished coop lacking only the chicken wire up up in the top sides and my son's babies...Gobbler and Cookie." I'm impressed this was built in only a few days and it is painted nicely. But do wish some step-by-step building photos had been taken as well as a picture of the interior. Not a coop build article. "Cute coop, needs more details"